Girrrl Stop! : Catch A Case! Hey Girrrl Stop Nation!! It’s been a little while since I’ve posted but hey that’s life! I hope all has been well and that you're taking time to enjoy the journey! A journey, something we're all on but we're all at different phases. Some may be in the ‘Harvest’ phase of the journey, that place where you are reaping those good seeds sown! Some others may be in the ’Spanx’ phase of the journey, that place where you're being squeezed, stretched, and constricted beyond what you would prefer! Some of us are in what I refer to as the ‘Metamorphosis’ phase, the place where you're in a state of becoming something totally new, better and beautiful. It's in this phase that we enter into what is known as "Protection Season"! Protection from what? Hurt? Heartbreak? Emotional damage? Toxic behavior? Poor treatment from others and ourselves? Well, yes you should do your best to protect yourself from all of these things because all of these things can have an impact on what you need to protect most: who you are becoming! Metamorphosis is a change of the form or nature of a thing or person into a completely different one, by natural or supernatural means. Of course the caterpillar comes to mind here, as it goes through its stages to full adulthood. 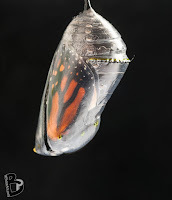 While the caterpillar is going through the process he becomes encased inside of clear protective case/covering (chrysalis) because although he hasn't reached the stage of being a butterfly yet, he's on the way and he has to protect what he's becoming! Girrrl it's time for you to catch a case! I'm talking to those in the metamorphosis stage of their life journey, to those going through a change (not to be confused with ‘the change’ - chuckle). This is the time to be focused on your personal development and be "future-ready"; protect what you're becoming. The "case" is a place of isolation, simplicity, solitude - catch it! This protects you during the process, sometimes you have to spend time with yourself and God, separating yourself from things that do not positively feed your spirit while God is working. Pray - Pray during this time for direction from God on where He wants you to go and what He wants you to do. Pray for strength to endure this phase and rest in God’s care. Psalm 91:1 says, “He who dwells in the secret place of the Most High shall abide under the shadow of the Almighty”, there is truly safety and protection in abiding in the presence of God. Meditate - Meditate on God’s Word and let it saturate your spirit. Listen to what the Lord has to say to you through His Word. Set aside some quiet time each day to spend time with God so that you can hear what He has to say to you. Joshua 1:8 says, “This Book of the Law shall not depart from your mouth, but you shall meditate in it day and night, that you may observe to do according to all that is written in it. For then you will make your way prosperous, and then you will have good success”. Develop - Read, read and read some more! This is your time to work on your personal development. Learn new information, work on your problem areas, and simply become better! Spend time doing things that feed you, things that you enjoy and don’t apologize for it! Hosea 4:6a says, “My people are destroyed for lack of knowledge” so take this time, in the ‘case’, to learn all you can and perfect your craft because this is all preparation for what’s ahead. Serve - What do waiters do? They serve. 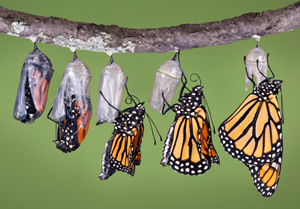 While you’re in the ‘case’, in waiting, in transition, in metamorphosis, never stop serving. Whether it’s at your local church, in your community, or with those around you, always strive to serve others. In the case of the caterpillar, when he’s in the case, he’s immobile but that is certainly not the case with us! During this phase, although inward work is being done, the reality is you still must interact with others and what better way to do that than to serve! Mark 10:45 says, “For even the Son of Man did not come to be served, but to serve, and to give his life as a ransom for many”. Don’t be upset if you caught a ‘case’! That just means God is transforming you into something new, better and beautiful! It is up to you to take the necessary steps to protect who you are becoming!